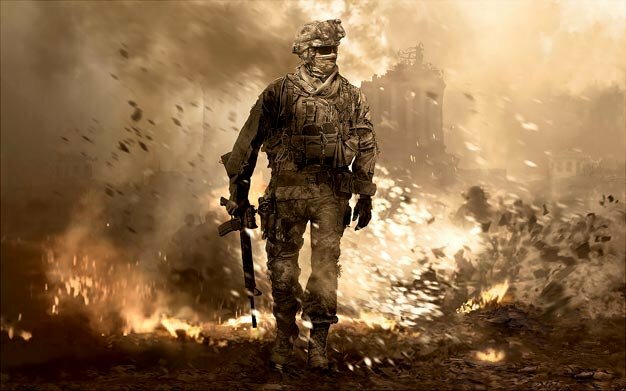 The Modern Warfare 2 launch has been a monster; a snarling, all-consuming, record-breaking behemoth. But it has also eclipsed everything else to such an extent that sales of Xbox Live Arcade games have plummeted, according to a report by GamerBytes. As part of their regular analysis of XBLA leaderboard data, GamerBytes have identified a significant drop in sales during the week of MW2‘s release, with some title’s sales halved. Trials HD, additional weekly leaderboard entries for which have been around the 15,000 for some time, dropped 40% to less than 9000. Similarly, South Park, Zombie Apocolypse and Tower Bloxx Deluxe all took sales hits of nearly 50%. You can check out the full findings after the break. 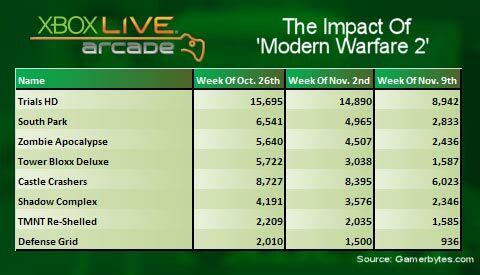 While there is no proven correlation between the release of Infinite Ward’s latest and this fall in sales, the evidence is compelling. Gamasutra (GamerBytes’ sister website) point to the recent XBL bannings as a potential contributing factor, but with MW2 recording a record-breaking 2 million concurrent players on XBL during launch week, it’s hard to see past the phenomenally successful shooter as the major determinant.